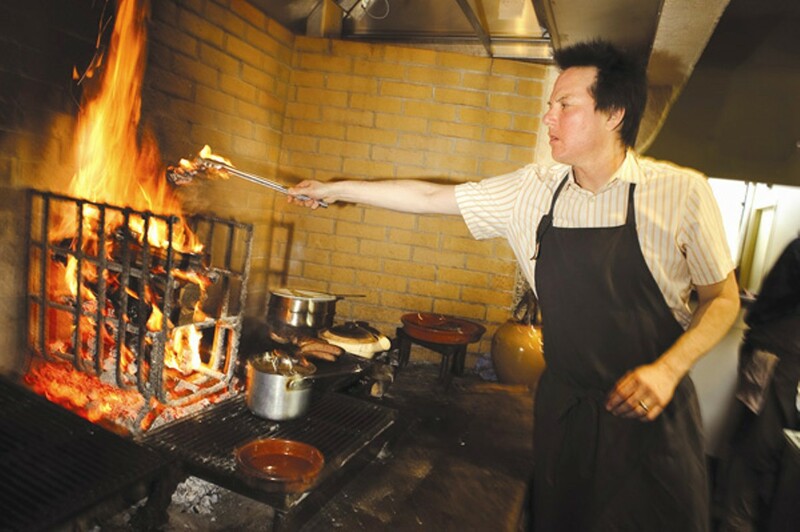 Top East Bay chefs, farmers, and restaurateurs look forward to the year ahead. 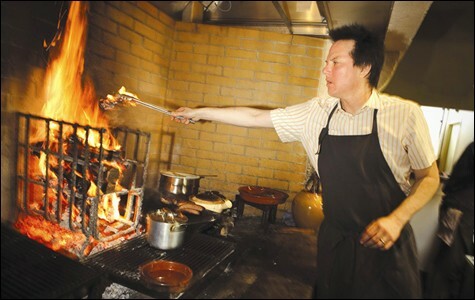 Russell Moore works the oven at Camino. I finished out the year by talking with some of the East Bay's biggest food personalities, finding out what they are resolving and looking forward to in 2012. The responses were sincere, inspiring, and even hilarious. Samin Nosrat, creator of the Pop-Up General Store, former sous chef at Eccolo: "Looking forward to: Writing! I've been scaling back in lots of ways in order to create more space and time for writing, which has always been my first love. New Year's resolution: To make stuffing at least once a month. That is to say, to find more delicious and unexpected ways to use up all of the fantastic bread from Pizzaiolo and Tartine that inevitably grows stale each week on my countertop." 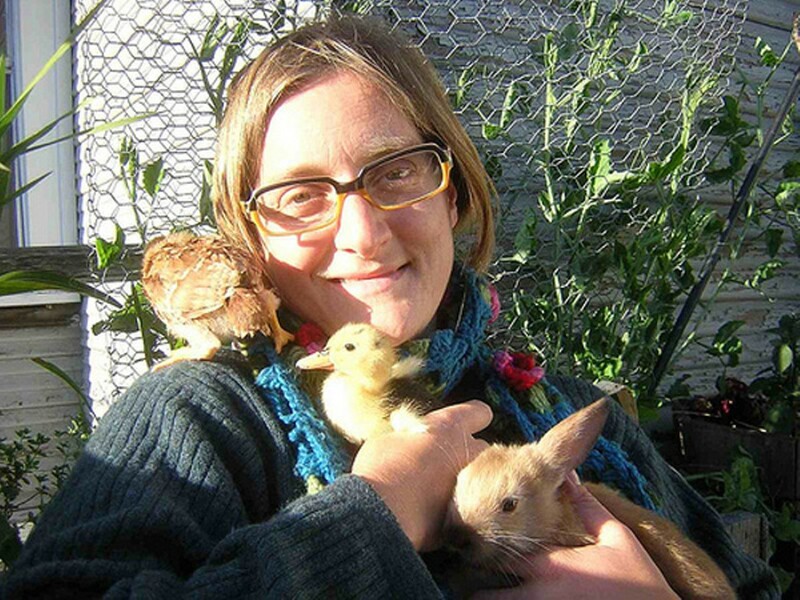 Novella Carpenter, urban farmer, writer: "Looking forward to: My new book, co-written with Willow Rosenthal of City Slicker Farms, is coming out! It's called The Essential Urban Farmer, and is a how-to guide for growing food and raising animals in the city. New Year's resolution: I'm pregnant with my first baby — due any day now — so my resolution for 2012 is to slow down and enjoy the fruits of my labors." Kevin Best, co-owner of B Restaurant and Bar: "Looking forward to: NBA season, winter veggies, fresh snow in Tahoe, more time out of the office and in the kitchen. New Year's resolution: Not only growing our business but also becoming a more valuable member of our community. And trying to train my cat to use the toilet. Seriously, I think he can do it." Amy Murray, chef and co-owner at Revival Bar + Kitchen: "Looking forward to: More goat, including expanding our array of cured meats and salami to include goat ham. New Year's resolution: Stress less, work smarter not harder, and continue to create more in-house produced foods, like cheese (we now make feta, ricotta, mozzarella), and butter. Another big goal is to start our rooftop garden and keep bees. We want our own local honey." Aaron and Monica Rocchino, owners of whole-animal butchery The Local Butcher Shop: "Looking forward to: Efficiencies in our operation, continued growth of our business, a puppy, and watching the local and sustainable food movement to continue to grow nationwide. New Year's resolution: To achieve more balance in our lives between work and play. To be better communicators of our message and our beliefs as well as not relying on telepathy to talk to one another." Gail Lillian, owner of Liba Falafel food truck: "Looking forward to: Everything. New Year's resolution: I stopped doing New Year's resolutions when I was a teenager. Life's been better ever since — it can't be a coincidence." Charlie Hallowell, founder of Pizzaiolo and Boot and Shoe Service: "Looking forward to: In 2012 I am hoping to open another restaurant and butcher shop, to start my project "Meat of the People," and to teach a class at the Oxbow School with my friend Samin Nosrat! I want to organize a curriculum around literature, narrative function, and cooking. New Year's resolution: To try my best to find more balance in my life. My philosophy used to be that only those with no passion really wanted balance, but I am suddenly craving a little. I would also love to find a way to pay every employee I have at least twenty bucks an hour. I'd love to employ more young people from Oakland. I'd love to figure out a way to employ some Oakland ex-cons. I'd love to help more people get more intimately involved with the food they buy, the food they cook, and the people with whom they are cooking." Anya Fernald, creator of Eat Real Festival and CEO of Belcampo Meats: "Looking forward to: We're opening two stores and a slaughterhouse for our project in California, a restaurant and brewery on our farm in Uruguay, and a rum distillery and cacao and coffee processing center at our farm/hotel in Belize. I also started a nonprofit with all my partners from Eat Real Festival in 2011 — the Food Craft Institute — that's opening its doors and offering its first courses this year. New Year's resolution: To stop procrastinating, but I'm not going to start until March." James Freeman, owner of Blue Bottle Coffee: "Looking forward to: Opening two shops in Manhattan in the early part of 2012 is what I'm most focused on, but we'll also be doubling our source trips, and tripling the amount of directly traded coffee in 2012. New Year's resolution: Leave my phone at home more often. Talk about coffee less and make coffee more. Play hooky with my family. Say thank you." Peter Levitt, co-owner of Saul's Restaurant and Delicatessen: "Looking forward to: If 2011 was our pastrami year, 2012 will be the year we change how people think of sauerkraut. It's a living thing that continues to gain flavor the longer it ferments; sauerkraut can be so much better than the clear pasteurized supermarket stuff. New Year's resolution: To think twice before using the word 'they.' It seems like no one's able to find middle ground and talk to each other anymore. I would like to remove the barriers between myself and my neighbors." Russell Moore, chef at Camino: "Looking forward to: This is going to sound really dorky, but we've got a new, under-the-radar goose source that I'm really excited to try out. New Year's resolution: More surfing. I used to do it all the time, but in my three and a half years at Camino, I've only gone surfing twice. My kitchen staff thinks it would probably help my sanity if I'd go more. It rinses your brain out." Be sure to visit the Express website for more highlights from these and other East Bay food personalities. Update: A previous version of this story misstated the surname of Gail Lillian.